Introduction: Nerve transfers for peripheral nerve, brachial plexus and spinal cord injuries can result in variable outcomes. 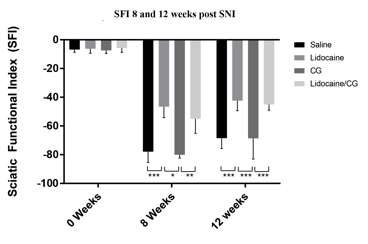 Here we investigated the neuroprotective effect of epineurial lidocaine injection in the donor nerve prior to transection, with the hypothesis that proximal axon loss would be decreased with consequent increased neuroregeneration and functional recovery. Materials & Methods: A rat sciatic nerve model was used with 4 intervention groups: 1) lidocaine; 2) lidocaine/calcium gluconate; 3) calcium gluconate (CG), or 4) saline (control). Behavioral testing and qualitative and quantitative histological evaluation was performed at 8 and 12 weeks. Histological assays included transmission electron microscopy, retrograde Fluorogold labeling of the dorsal root ganglion (DRG) and whole mount immunostaining of the nerve coaptation site. Results: Functional assessments through the sciatic functional index (SFI) (Fig. 1) and Basso, Beattie and Bresnahan (BBB) scale showed a statistically significant increase in recovery at 8 and 12 weeks with lidocaine treatment. Preservation of normal nerve architecture and significantly higher axonal counts were obtained in the lidocaine treated groups, with fragmentation and increased myelin damage in the CG and saline groups (Fig. 2). 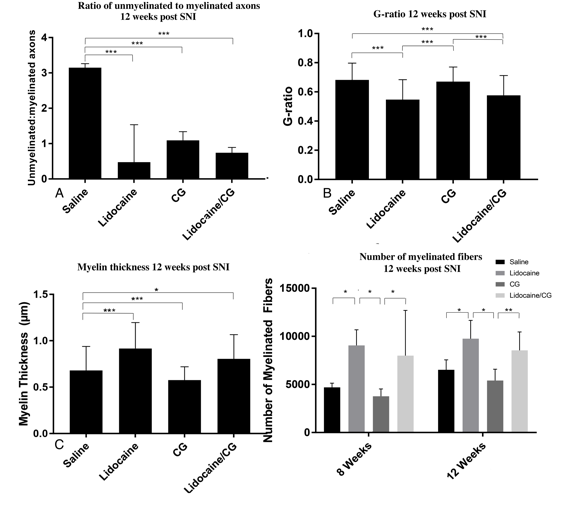 Retrograde Fluorogold labeling of DRGs showed a statistically significant increase in the number of L4-6 DRG neurons in the lidocaine treated groups. Whole mount immunostaining identified the extension of the axonal growth cone past the nerve coaptation site in lidocaine treated groups but not in CG and saline groups. Conclusions: Our results suggest that epineurial lidocaine injection prior to donor nerve transection for nerve transfer has a neuroprotective effect, resulting in increased proximal axon counts and correlating with an increased and more rapid nerve regeneration and improved functional recovery. These findings have direct and immediate clinical application through a simple and inexpensive intervention for promoting improved clinical outcomes after nerve transfer.